MAC Rocker Chick "Look in a Box"
This is the second “look in a Box” write-up and video that I’ve posted; I think that the “look in a box” sets are really well thought-out, and if you (like me!) sometimes feel overwhelmed by the sheer variety of products that MAC offer, this can be a good way to introduce yourself to the brand. Rocker Chick is priced at £30.50 and includes two eyeshadows (‘Electra’ and ‘Black Tied’), a Glaze lipstick in ‘Hue’, a lipglaze in ‘Oyster Girl’, a black Dazzle Lash mascara and an Eye Kohl in ‘Smolder’. It should be pretty obvious that the “Look in a Box” offers a great saving on buying the products individually – you’re getting roughly half the products for free. I’m impressed with the combination of products chosen for this “look in a box” – they can be worn casually, or really built up for an intense, heavier look. Useful bits of makeup for any kit! Take a look at the video and see what I did with the products in the box – for full information, see the Shopping List below the video pane. Shopping List: Rocker Chick Look in a Box, £30.50. “Packed to Go”: set of three eyeliners, £30, and set of three lipsticks (in Plumful, Pretty Please and Hug Me) £28.50. 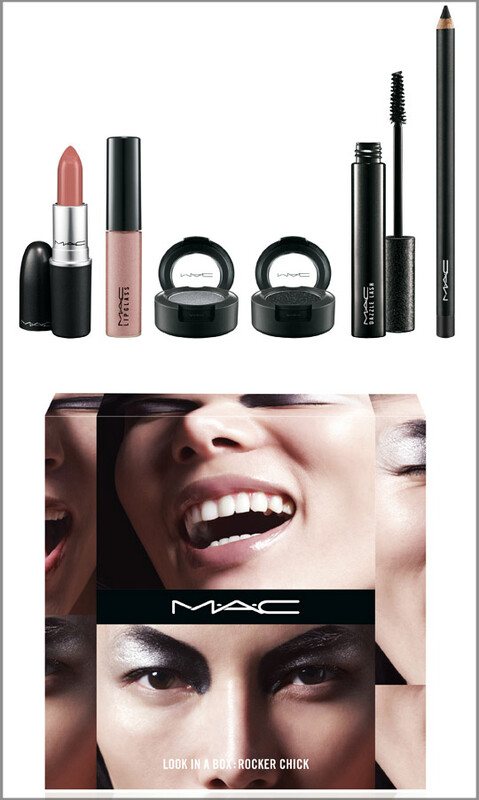 All available from Travel Retail (airport) MAC counters, or shades can be obtained separately from normal MAC retail. Previous Post MAC Girl Next Door "Look in a Box"